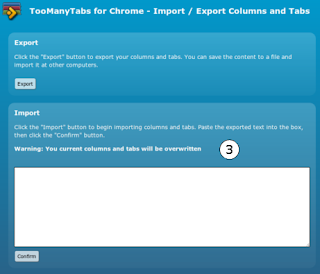 In this new version, you can export your suspended columns and tabs and import it in another machine. You can also save the exported content in a text file as backup. 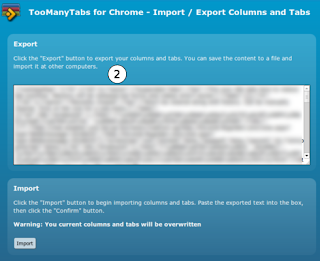 Step 1: Click the "Import/Export" button in the TMT popup window. Step 2: Click "Export" and copy the contents in the textbox. 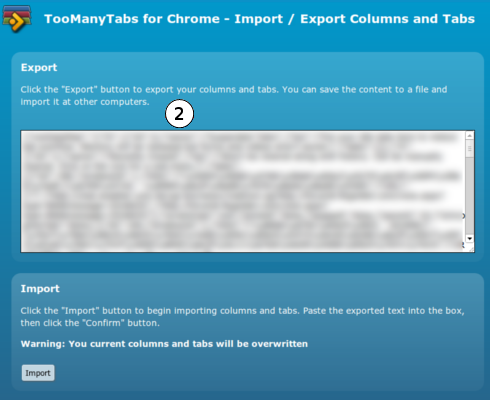 Step 3: Copy the contents to the machine you want to import, and paste in the "Import" box. I noticed that you have detailed video tutorials for TMT Firefox but I don't see any tutorials that deal SPECIFICALLY w/ TMT for Chrome. There are numerous differences between the browser's platforms and so even though the tutorial on TMT for Firefox gives you the basic idea of the different features that are available but it DOES NOT show exactly what the options windows look like when u r running TMT in Chrome and the TMT Preferences window that you show in the TMT 4 Firefox Tutorials does not even remotely resemble the TMT Preferences window in the Chrome platform!! Also is there any way that I can set TMT (Chrome) to appear as a full window (or full tab)?? Many times I have 20+ tabs and in order to be able to see all of the TMT preview panes, I REALLY NEED TO VIEW TMT IN A FULL WINDOW -- NOT IN JUST A DROP DOWN / POP-UP FROM THE TOOLBAR!!! I hope that the TMT developers can respond to this soon. Thank You so much for your help ... I think that TMT as well as virtually ALL of the other Visibo Browser Extensions will make the work that I do and the 12+ hours that I spend every day working on our non-profit's website CONSIDERABLY EASIER!! (A lot of my work means that I use Chrome for a LARGE PERCENTAGE of that time!! @dftm: Hi, you can press "ctrl + ~" to open TMT Chrome in a new window. Also here is the link to the video, http://blog.visibotech.com/p/toomanytabs-for-chrome.html. Hope it helps.